Emerging flowers look quite different than their mature blooms. 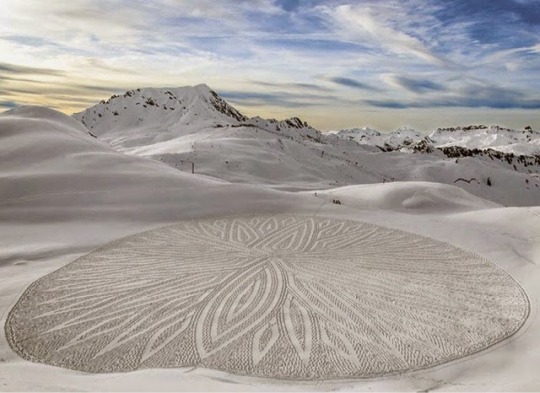 For the past decade, Simon Beck has been decorating the mountains with his stunning mathematical drawings, created by running in snowshoes across the freshly laid snow. Each image takes him up to 11 hours to make and covers an area about 100m x 100m, requiring him to travel up to 25 miles as he marks out the pattern. Beck produces about 30 snow drawings every winter in the northern hemisphere, mostly in the Alps. He started 10 years ago doing it for fun and now it is his main occupation. “When you have a blank piece of paper you draw on it,” he says. “So drawing on a blank snowfall seemed like a natural thing to do”. You can learn about the fine details of his process in this FAQ and see additional photos over on Facebook. He also published a book of his work titled Simon Beck: Snow Art. Nice that the spiders have got into the action, too, Mary. Mary MacADNski: Spiders and all manner of bees love this summer plant. Superb Mary! I love it. Mary MacADNski: Young and ready for the world, Richard. Mary MacADNski: This whole series had second shots but some in the early days disappeared. Mary MacADNski: Thanks all around. You are so right about the blooms Mary, quite a difference. Mary MacADNski: I love seeing them at this stage and watching them turn inside out. Mary MacADNski: You must have echinacea in your gardens. A stunning shot of a stunning bloom! Mary MacADNski: Thank you. What is my prize? It is bursting out of the screen Mary. Mary MacADNski: Tulips are bursting out all over my house, Echinacea in my memory and on screen. Still looks good though doesn't it. I like the snow patterns very much. Mary MacADNski: It gets wider and wider every day. I always like the spiky look at this stage. Mary MacADNski: I do too. They are great flowers. What a pretty, sunny shot!! LOVE the ice sculptures! Thanks for sharing! Mary MacADNski: Easy to compare the young and old here.